Close down a regional airport for a week, fill it up with the latest and supposedly greatest new cars available, add a heaping helping of car writers and what do you get? Test Fest, the annual gathering of the Automobile Journalists Association of Canada (AJAC), at which they drive similarly-classed vehicles back to back and vote on them, the results eventually helping to name the Canadian Car of the year (CCOTY). I was invited to take part in this year’s Test Fest, an event that's not only an eye-opening experience and a great way to drive a whole bunch of interesting cars back to back but which is, obviously, a heckuva lot of fun as well. It isn’t just a chance to go wild with wheels, though. Test Fest is designed to offer as honest an apples-to-apples comparison as is possible for mere humans, and that means there are rules to follow. For instance, the vehicles are broken down into categories such as “small car under $21,000" or "Prestige Cars". In order for your vote to qualify, you have to drive all of the vehicles in a category on the same day, over the same road/street/track or off road course (depending on the category), and if you don’t make it through the whole bunch in one day you have to start over. This is where the writers' subjective opinions come in, the "secret sauces" as it were – but there's also a sophisticated rating system that's more objective, based on such parameters as acceleration, braking, fuel mileage, safety features, roominess and more. I was assigned to Small Car over $21,000, Luxury Car (yeah, it was rough), and SUV/CUV over $60,000 (ibid), so I had to drive at least 18 vehicles and rate various issues on a scale from one to 10. Parameters included interior and exterior styling, overall quality, handling, braking, amenities, and the like. It’s a great way to get a first impression of a vehicle though, since you’re limited to less than 40 minutes each, an impression is all you get. The small cars came first and I drove all seven back to back. I figured going in that the Mazda3 Sport would be my favorite, because I love it, but the Volkswagen Golf edged it out in my own subjective tally by a mere half point because of its simpler user interface. To illustrate how important my opinion is, the Mazda3 won. And that's fine. The category also gave me my first experience in a Kia (the very nice Forte Koup, and the Soul) and the Mitsubishi Lancer Sportback "wagon" (which I liked a lot). 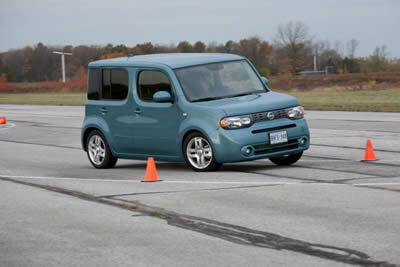 I'd driven the Nissan Cube (and thought it would flip over on the track, but to its credit it didn’t), the Honda Insight and the 3 before, and a different version Golf. The test route took me across wonderfully sleepy country roads, some mild urban routing and a stretch of busy freeway. Also included was a very bumpy railroad crossing and the track, the latter of which was laid out on the airport’s runways with cones, which worked well whether I was driving the Kia Soul or the Porsche Panamera. It had some fast stretches, tight curves, slalom and was a pretty good layout for a temporary setup on an airport closed temporarily. Next came the Best New Luxury Car category, which ended up pitting the Mercedes E-Class Sedan against the BMW 335d Sedan and the Cadillac CTS Sport Wagon. This was a tough one. The Cadillac had the best interior (though I loved Mercedes' digital version of the old fashioned analog radio tuner), the BMW was easily the most fun to drive. The Benz split the difference really well, though and was my choice. Naturally, the BMW diesel won. By then I'd driven about 10 cars in a row, with a break for lunch. It was too late to start another category, so it was fantasy time. The Panameras were taken, of course, so I consoled myself with the Audi R8 5.2 FSI. 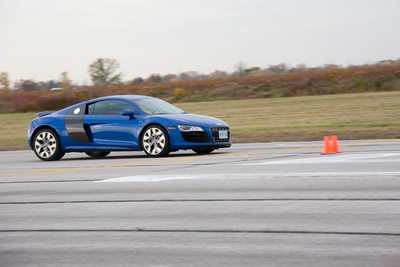 It was my first time behind the wheel of Audi's acclaimed two seater, but it was worth the wait. This year's entry growled through a mid-mounted V10 engine and was flat and stable on the track. I didn't like driving it nearly as much on roads; the left leg position was uncomfortable. On the other hand, Audi's famed road holding and a slick, gated six speed manual transmission are powerful aphrodisiacs. 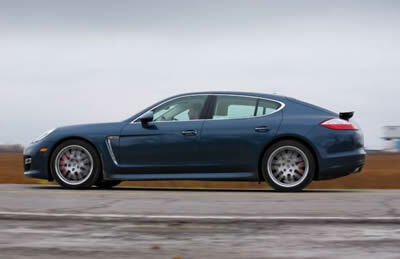 Then the Panamera was back! Porsche's new four door four seater is a big gamble for the company and is probably as controversial – at least until it proves itself – as the excellent Cayenne SUV was when Porsche announced it. The car's most arresting view is from or at the rear, but it looks a lot better in person than in the pictures – almost with a little E Type Jaguar bum thrown in, though taller. And it's big! But it isn't fat; it's all Porsche. I'm a sucker for Porsches and I really wanted to like the Panamera but I was scared, not only by its maximal gluteus but by pictures I'd seen of an interior that looks too busy by half. And there are buttons galore, but they seem laid out logically – I only had a chance to use a couple (such as switching to "Sport Plus"). I look forward to Porsche offering me one for a long term test really soon. Anyway, it really is a Porsche, very fast, very drivable and very comfortable. 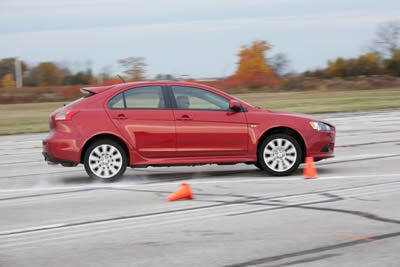 I hope it becomes the 2010 Canadian Car of the Year, which will be announced in Toronto next February. It's appears to be everything it aspires to be and it's a gutsy move for Porsche. The next day I drove the Best New Small Car (under $21,000) entries: the Hyundai Elantra Touring, Kia Forte Koup and Mazda3. I liked them all – and was particularly surprised by the Kia, which is very nice – and while I thought the Hyundai would win I liked the Mazda3 best. The Touring is very worthy, especially since I like wagons, but it's hard to argue with "Zoom-Zoom". On this, I my voting streak ended: the 3 copped a second win. I was also assigned Best New SUV/CUV (over $60,000). There were five very nice vehicles in this class: the Acura MDX, Audi Q7, Cadillac SRX, Lexus RX450h and Lincoln MKT. I'd have been happy with any of them but chose the MDX. Needless to say, the Lexus was declared the category winner. Once the category winners were named, we had to make sure we'd driven them all so we could vote for the 2010 Canadian Car of the Year and 2010 Canadian Utility Vehicle of the Year. The most memorable of them were the Audis; the S4 is a peach, while the closed roof of the A5 Cabriolet looked almost like it was fixed rather than retractable, a very nice job of design and execution. The Ford Taurus has a very nice interior and is pleasant to drive. I'm not lusting after its exterior, though. The Lexus RX450h had that new mouse-like "Remote Touch" controller that was neat, but the heads up display tended to draw my eye to it when I wanted to be watching what's up ahead on the road. One of my peeves with today's roads is drivers who seem trained only to pass the test, not to actually drive as if it matters, and as averse as I am to having government in our lives, I'd like to see mandatory performance driving tests – at the student's expense – before a driver's license is issued. Such will be the case when I become Emperor, so you'd better get ready. 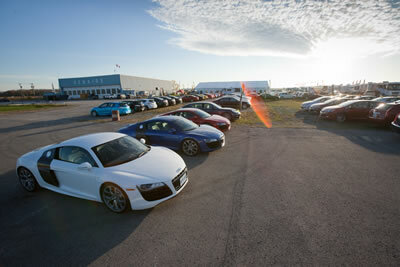 This made the inclusion of the Advanced Driving Course sponsored by Volkswagen Canada such a welcome bonus. I've taken such courses before and they're not only bags of fun, they also help you sharpen your skills in ways that you can use every day on the road. Such was the case the third day at Test Fest as a group of highly qualified instructors led by Pierre Savoy got us braking for best efficiency, using our vision properly, learning how to take curves and corners better, weight transfer issues and more. It was a blast! And now I look at some things, such as my preferred driving position, differently. I've always taken something away from these courses. Now that Test Fest is over it's back to the normal drudge of having to drive a brand new vehicle nearly every week. Someone has to do it, though, and I look forward to reporting on some quality seat time in a crop of excellent motor vehicles.